In approaching his design, he operates like a sculptor removing superfluous material, explains Andrea Crosetta. 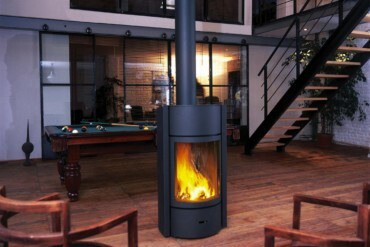 And he concentrated on all those things that make life warmer: radiators, burning stoves. “Bubble” is one of his most successful products. 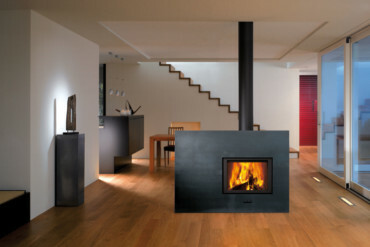 Bubble Wood can either be fixed to the wall or ceiling to create a fireplace in the middle of a room. It has an average output of 5.2 kilowatts. 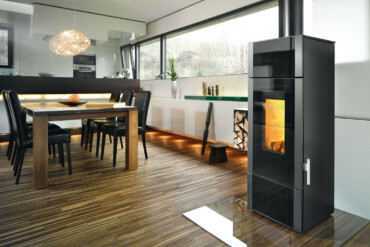 Thanks to its side windows this model by Attika lets you look at the flames from every angle. 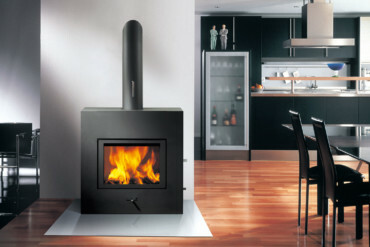 And by simply pulling the locking button the stove can be rotated by 360° and locked into one of eight positions. 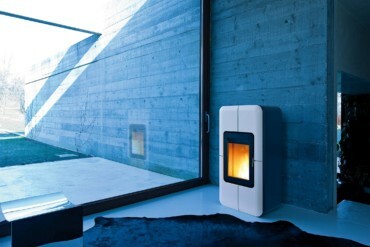 With an output of 5 kilowatts it is suitable for rooms up to 215 cubic meters. 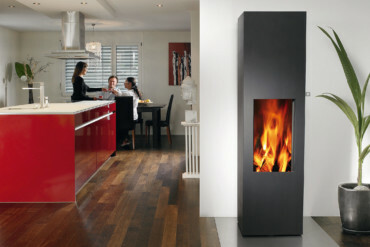 A slim, streamlined model just 40 cm wide and deep, it not only celebrates fire per se, but is also space saving. Bullerjan asked designer Sebastian Herkner to design ceramic tiles for their successful model “B²”, which are applied to the sides and can store heat for up to six hours. Hand-made in Bavaria, they come in colors such as peach, honey, nymphea, fern green and in matte or shiny white. 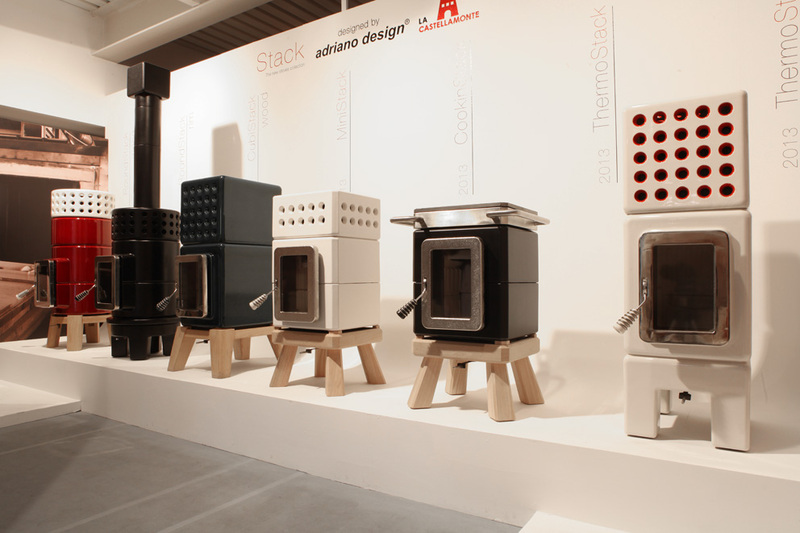 They are also available in two different thicknesses, adding 45 or 85 kg additional weight to the stove in the guise of ceramic cladding. 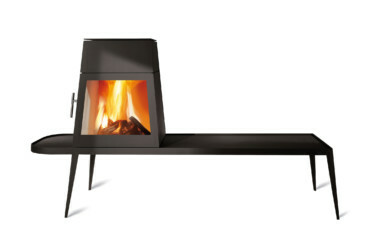 Herkner also designed an attractive bench on which you can set the stove and then sit yourself. 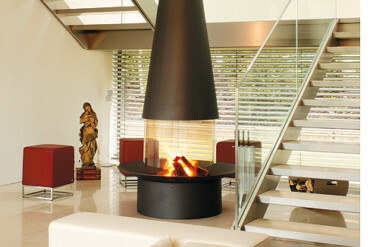 “It is magnificent – congratulations,” wrote Lord Norman Foster to Dominique Imbert, by way of thanking him for the fireplace Imbert had built for him. Imbert also developed a smaller version of this Foster model for his company Focus. 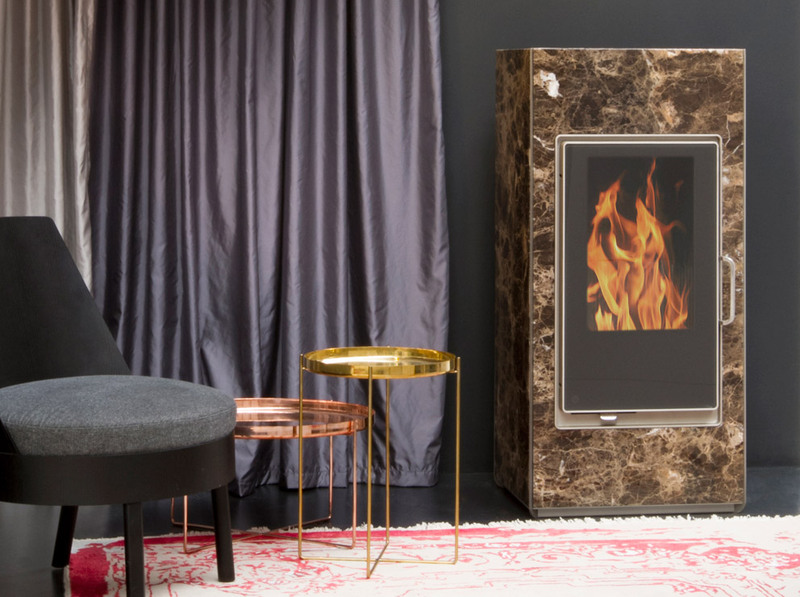 There is something archaic about the round fireplace with hood, which comes either with or without sliding glass panels – and you almost feel you are sitting around a campfire. 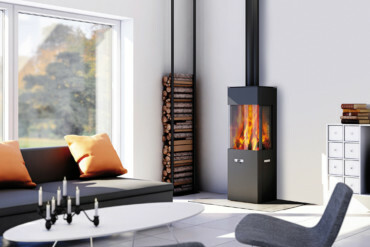 Though it has an output of 4 kilowatts, it has only 40 percent efficiency, making “Filiofocus” more suitable as an eye-catcher than a heating device. 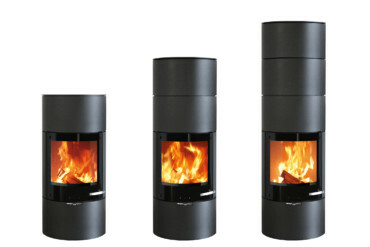 No matter where you sit, the flickering flames in the latest model by Hase from Trier can be enjoyed from all sides as the round stove can be rotated 360°. “Lisboa” is fully clad in ceramic, which comes in eleven colors and has either a spiral or a delicate ring structure. 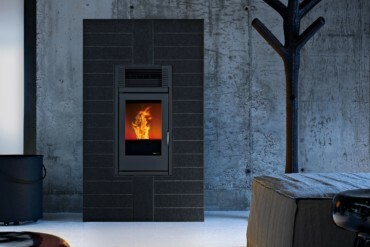 Measuring 147 cm high and just 45 cm wide, the stove will also fit into smaller apartments. 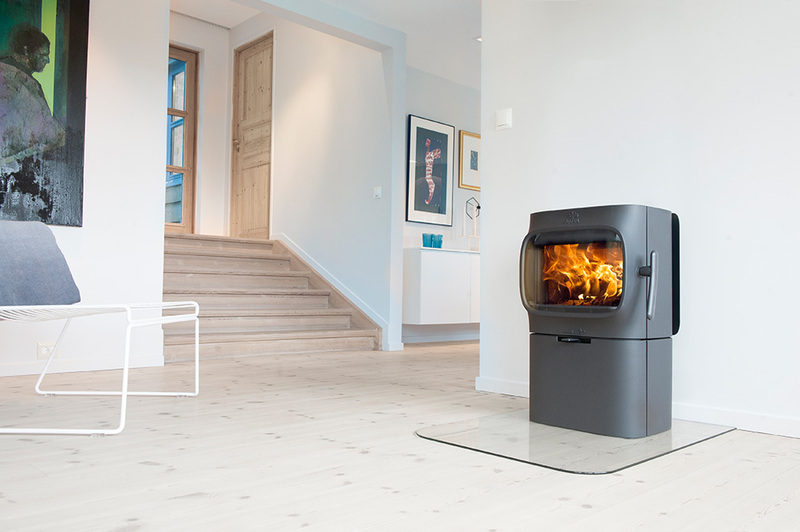 It combines a technical look with elegance – thanks to its oval, sculpturally designed door: the “F 105 B” by Norwegian manufacturer Jøtul. 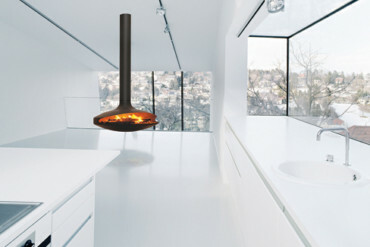 In white paint or black enamel finish it combines both radiant and convective heat, according to the manufacturer. 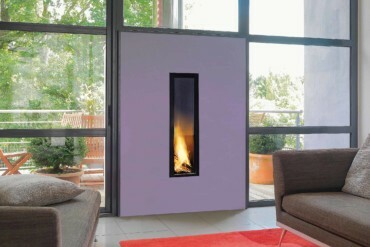 With a height of 690 mm, a width of 410 mm and a depth of 350 mm it has a solid look about it, and the generous window offers a horizontal view of the fire which is similar to watching television. 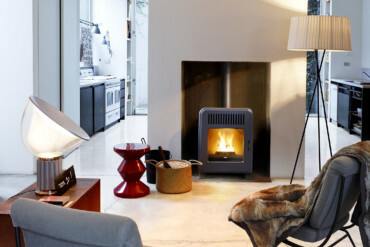 Unlike many other wood burning stoves, with an output of 8 kilowatts “Logastyle Convexus” not only heats the rooms but also the home’s hot water system. 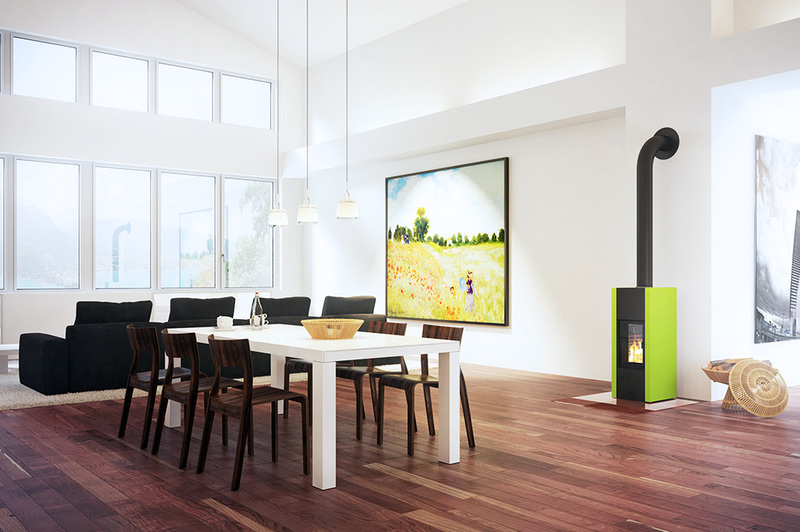 The stove by Munich designer Stefan Diez gives off 35 percent of its heat to the room it stands in while the remaining 65 percent flows via an integrated heat exchanger into the domestic heating circuit. 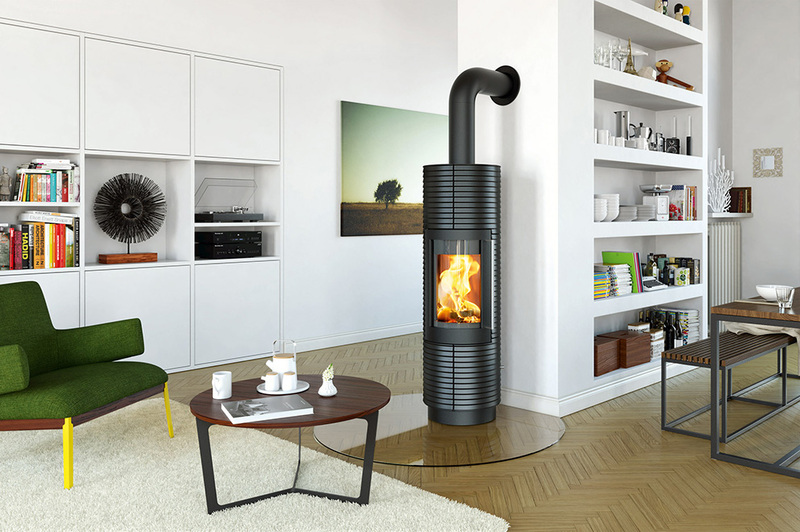 As such, the “Diez stove” is a small heating and power station; moreover, it is very handsome with its gentle curves and attractive colors. 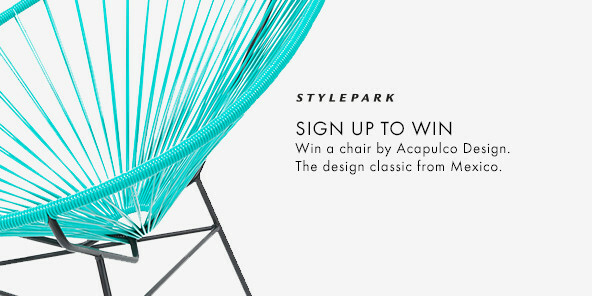 For this innovative interplay of technology and design the model received the “German Design Award 2016” from the German Design Council. While some people are content to watch a video of burning firewood, Italian design team Emo Design decided to combine image and reality. 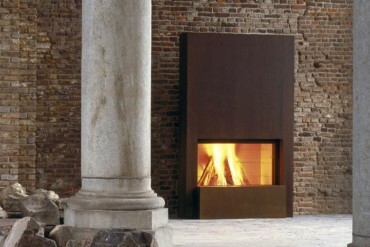 The result is a side-by-side fireplace/TV “Scenario” for Italian manufacturer MCZ. 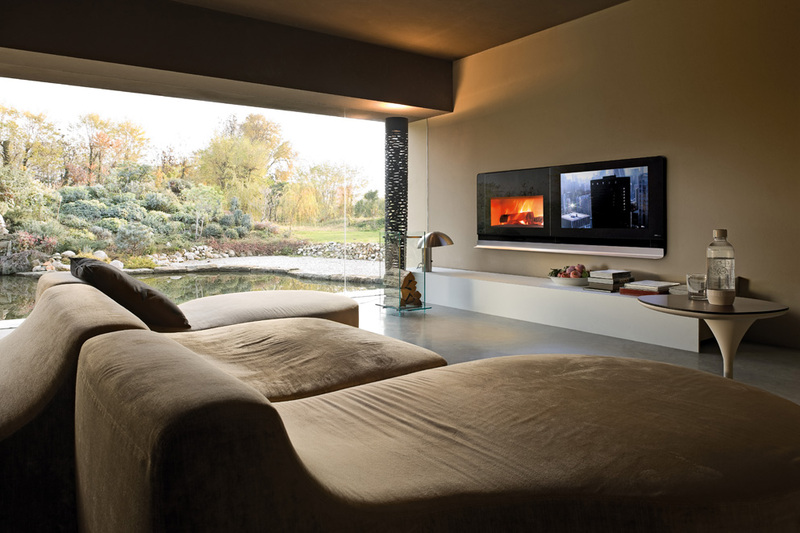 One side of the 205 mm-long casing houses an LCD television by Loewe, while the other side is occupied by a fireplace. 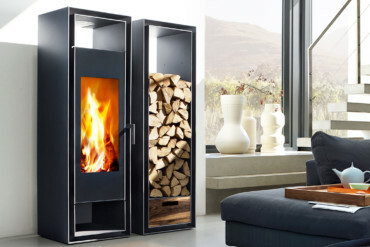 Customers can choose from a “Vivo 90 Wood” or the gas-operated counterpart “Forma 95 Gas”. 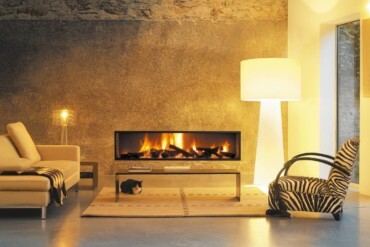 So what is more relaxing, we wonder: watching a burning fire or the TV. Or the two together? We are all familiar with preselection settings on washing machines. Indeed, today the entire home is supposed to smarten up and manage itself so you can also control it remotely. 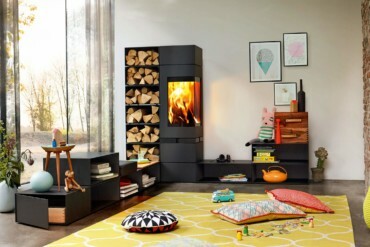 This trend can also be seen in some wood burning stoves. For example, “Idea Multi Air” with “Rikatronic4” technology by Rika from Austria can even light its logs automatically when programmed by smartphone. Owners need only consult their display to see when new logs are needed. But you will still have to add them and remove the ash yourself. 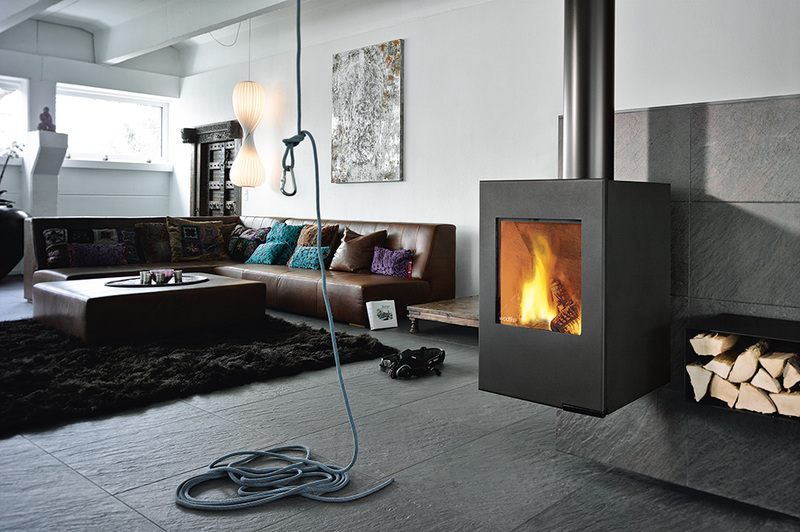 Traditional German manufacturer Wodtke also includes a suspended stove in its range. Thanks to a special console “Rocky” can be mounted on the wall at any height. 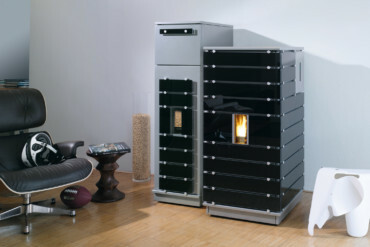 The standard “Wodtke Air Control” automatically controls the combustion air and consequently the burning process, which is especially useful when lighting it. 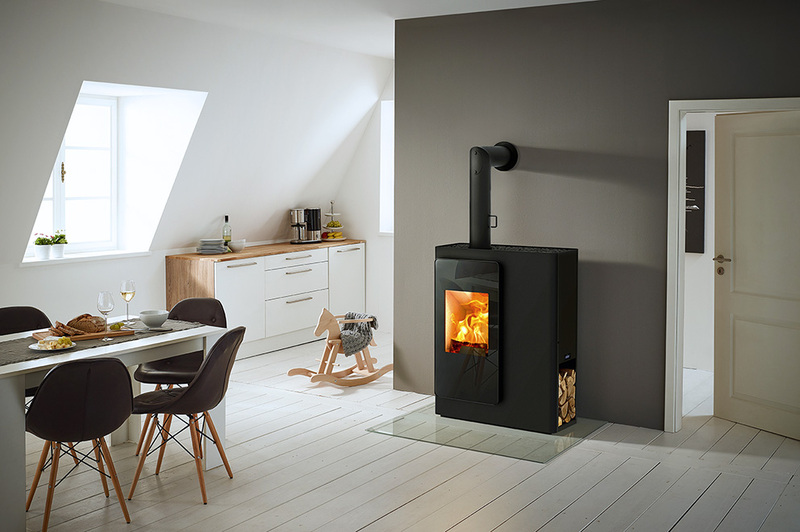 With a heat output of 6 kilowatts, a large front window and robust double-wall steel body this stove is not only attractive, but also practical. 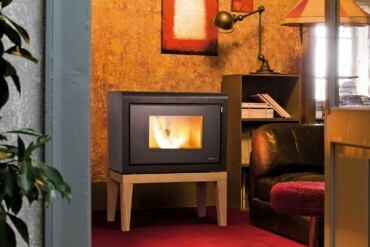 As Swiss manufacturer Rüegg explains, “Swooden” means “relaxing in an enjoyable, healthy way”. The tiles on the sides, which not only come in the basic shades of pearl white, lime green, golden yellow or black-brown, but also in other colors, store the heat and give it off slowly. 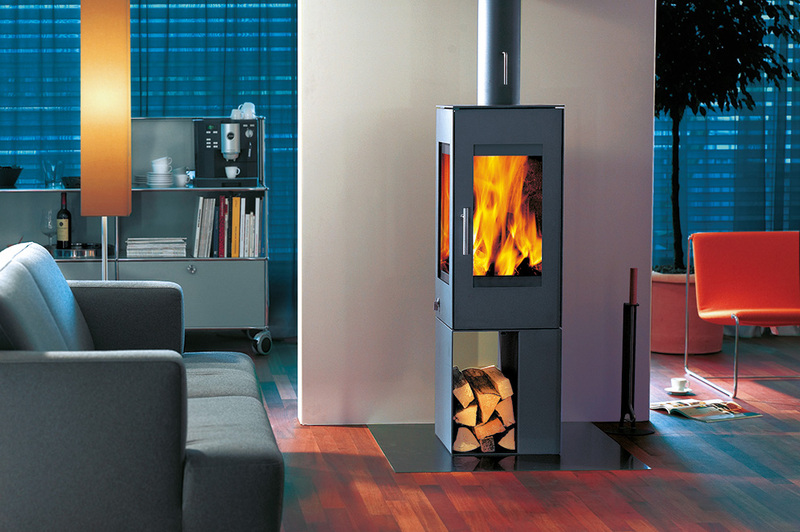 The 101 mm-high “heater”, as such stoves are called in Swiss German, boasts an output of 5.9 kilowatts and 81 percent efficiency. It also boasts low emissions and carries a Swiss Minergie-Module certificate for energy-saving devices. 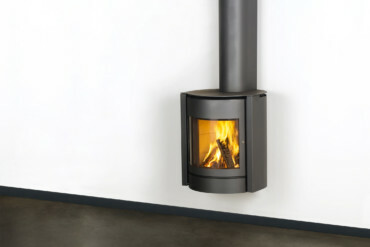 Pirouettes are not the sole province of ballet dancers, indeed, some wood burning stoves can also perform them, though admittedly not as quickly. 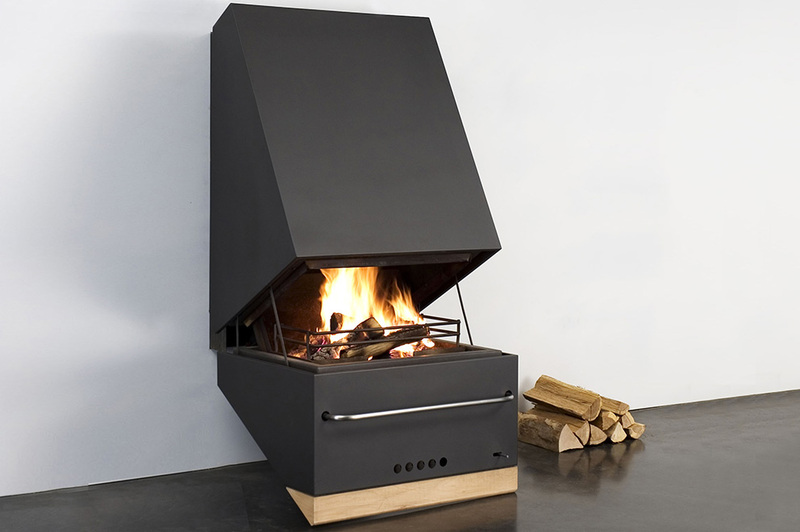 Take “Turn”, a rectangular-shaped steel stove by designer duo Marie Schmid-Schweiger and Florian Viereibl for Skantherm that can be rotated 360° around the stove leg. 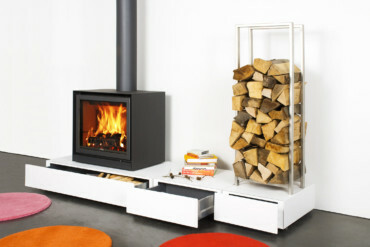 The storage space for wood acts as a counterweight to the burning chamber. 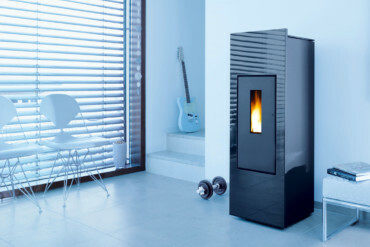 With a heat output of 3 to 5.6 kilowatts “Turn” is ideal for smaller and medium-sized rooms. 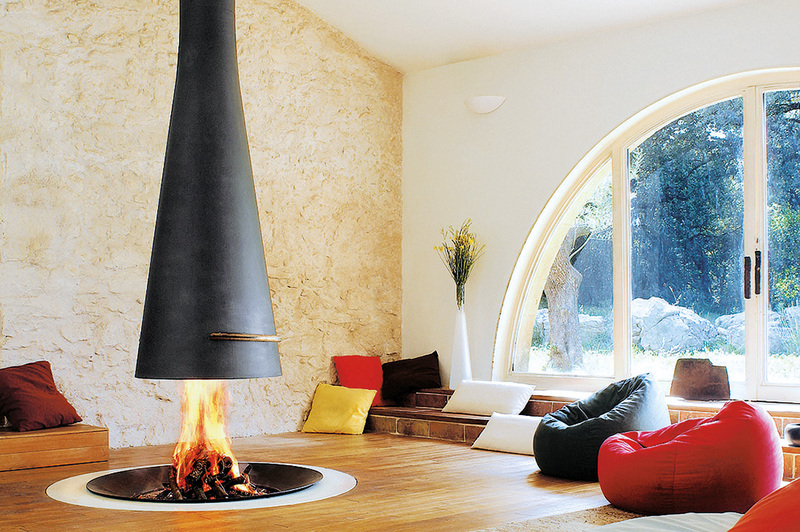 The flue pipe must run through the ceiling. The “Stack” models for the Italian firm La Castellamonte resemble likeable extraterrestrials – no doubt also because they look so cute on their bases, of which there are five versions. 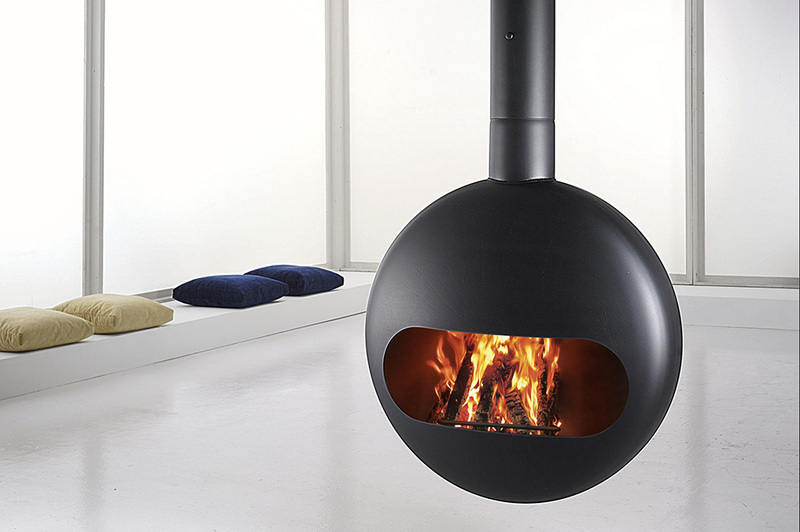 Otherwise, another eye-catcher of these ceramic stoves is the air vent above the combustion chamber. 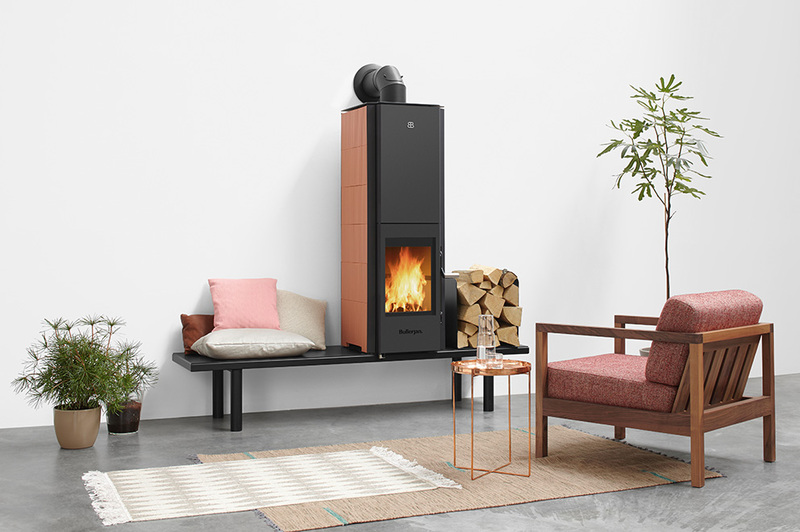 The round “Stack” comes in two different heights of varying outputs: While the 113 cm-high, round stove has an output of 6.5 kilowatts, its somewhat taller brother (137 cm) boasts 7.5 kilowatts. 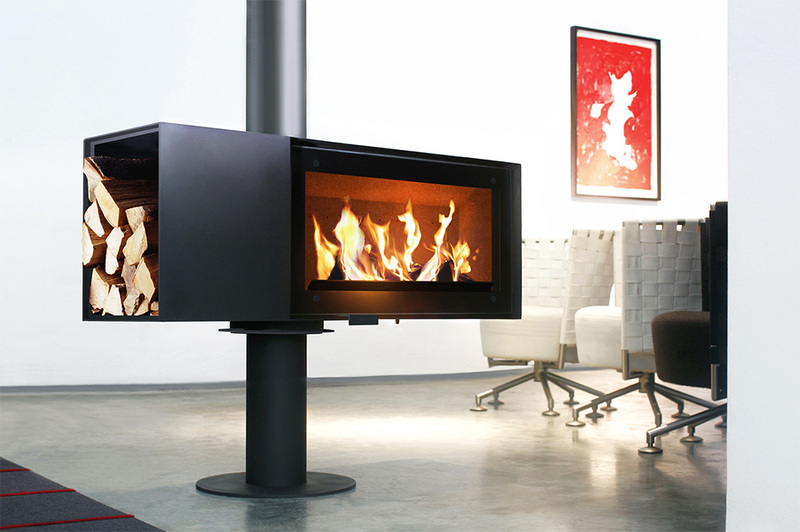 The angular “Cubi Stack” with a height of 128 cm has a nominal heat output of 7.5 kilowatts. 60” without a computer or modern technical equipment, but it still works perfectly today and looks good to boot. “Ysen” means iron in Germanic – and that just about says it all. In its austere pyramid shape it calls to mind past times. 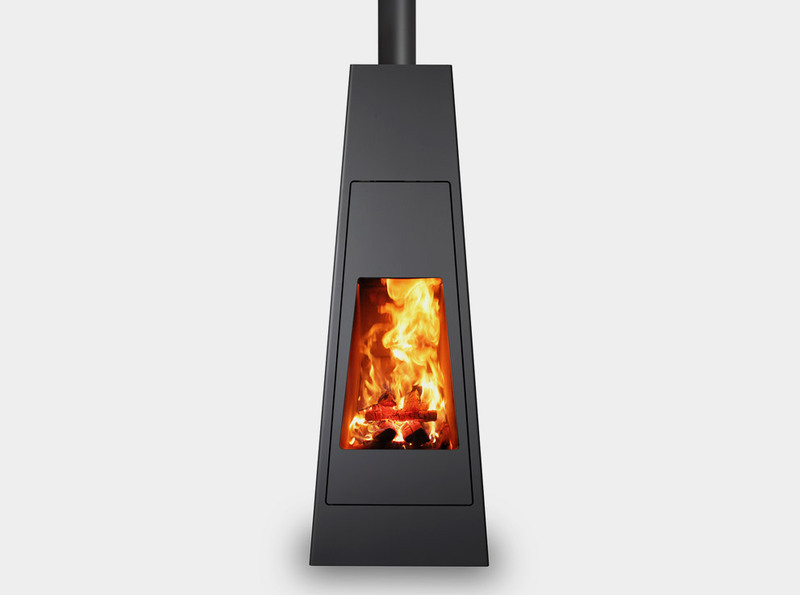 The parts of the 1.80 m-high model by Dutch stove designer Harrie Leenders are milled from a solid piece of iron. 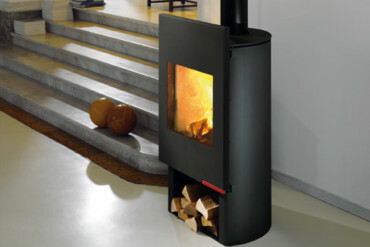 The stove door can be simply lifted up by a handle on the side – which does not mar Ysen’s striking smooth “face”.